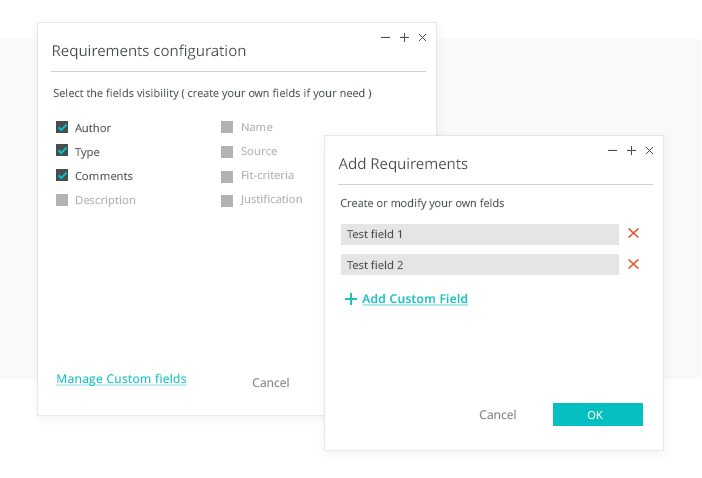 We’ve got a jam-packed lineup that includes custom requirements fields to further improve your prototyping and validation process across your teams with Justinmind Enterprise. Missing summer? We’ve got just the thing to warm you up: our brand new release is ready for all of you Justinmind lovers! Apart from our new custom requirements fields, we’ve also added scenario simulation and auto-fit upon simulation, to enhance the user experience when testing on multiple devices as well as. And we’re super excited to officially announce our partnership with user testing and research platform, Validately! Read on for more details on these awesome updates! As you know, Justinmind Enterprise helps you to build smart business solutions by securely integrating requirements management with design across all of your teams: UX, Business Analyst, Design, Product Management and Development teams alike. Up until now, you have been able to define project requirements in context with your prototypes. With the Requirements field in the Justinmind editor, users have been able to define requirements in up to 15 fields, including Name, Source, Description, Author, Start and End Dates. We understand that when it comes to requirements, business is personal. With this update, Justinmind Enterprise users can now customize these fields and add an unlimited number of new fields, as their needs require. There’s the option to edit the requirement fields for individual prototypes, by configuring requirements per prototype. But wouldn’t it be even more impressive if you could have consistently personalized fields present across all of your prototypes? You got it. With the update, you can also set master requirement fields so that all of your prototypes will take on the changes. The changes you can make to the fields include including/hiding default fields and adding/deleting/renaming your own custom additions. Find out more here. Pretty cool we hear you say? Indeed it is! But that’s not all…! Up until now, you were able to design scenarios in your interactive prototypes in order to define user flows. Built with the user in mind, as all of our features are, this enabled you to map out the user journey through your website or mobile app, such as making a reservation, purchasing a product or subscribing to a newsletter. With our new and improved user scenario design, Justinminders are now able to view each scenario in simulation, just as they can view their prototype in real-time. This should definitely improve the way you present navigation flow to your team and all stakeholders! For more information about how to simulate scenarios, click here! Awesome…! But wait, there’s even more in store! 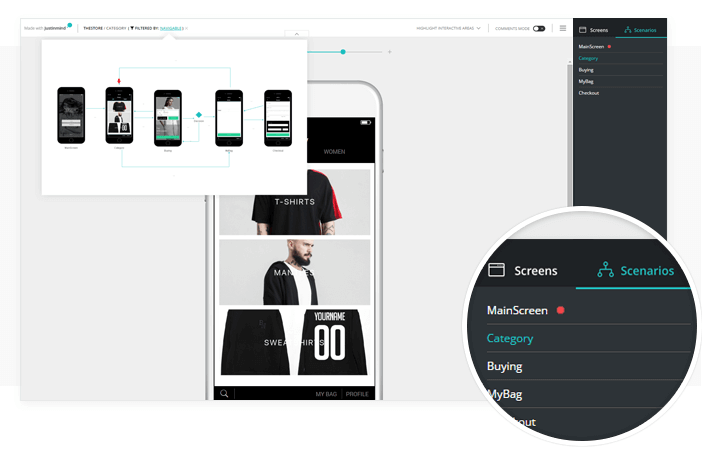 You may already know that you can build adaptive, liquid and responsive design into your Justinmind prototypes. But, it can sometimes get a little bit fiddly, right? Especially when you just want to see how your designs are going to pan out on iPhone 6+ instead of iPhone 6 and you’ve got to adjust, and then readjust again, ugh. Now, you can perform auto-fit movement upon simulation so that you can really envision how your designs are going to look on multiple devices, including iOS (all versions from 4s onwards), Android and Google Glass! In the Justinmind editor, our “Fit to screen size” option in the simulation settings allow you to auto-fit your prototypes into whatever screen size you need, which will really come in handy when you want to simulate on multiple devices! Download Justinmind today to make the most of our new release! Our brand-new iOS widget library is up and running! If you’ve tried out our previous iOS widget libraries, you’ll know what they’re about. With our latest iOS library, we’ve tapped into the atomic design elements that we incorporate into our Android widgets. In contrast with previous iOS libraries, which were built using images, our iOS widgets, icons and screens have been created using basic JIM iOS components-which means you can customize and add them even more easily! Our ready-made screens have been built using tables and cells instead of dynamic panels, for better navigation within the editor and all-round better usability! The 6 most-used components by Justinminders feature in the top window of the UI library. The position of icons in the library have also changed from most basic to complete, to complete most basic for better visibility and to help you kick-start your prototyping! This month, we’ve launched a new partnership with leading user testing and research software platform, Validately! With the launch, Justinmind users can now easily test their prototypes using Validately’s platform in order to get immediate user feedback. The partnership allows Justinmind users to conduct quick usability tests as well as more in-depth research interviews in Validately on their Justinmind wireframes and prototypes. Click here to learn more about how to perform user testing with Justinmind and Validately! Apart from all of this, we’ve also improved the functionality of the Proxy settings in Preferences>Network Configuration and corrected some bugs, including some group selection changes and drop-downs on floating shell. As you can see, this upgrade was really worth the wait! Try it out and let us know what you think! As always, we’re always open to comments, questions or even complaints—after all, your feedback is how we know where you need us to improve.